The space between the planets is populated by billions of particles mostly from asteroids and comets, which are following orbits around the Sun. We call them meteoroids, defined by the International Astronomical Union (IAU), as a particle larger than a micron and smaller than ten meters in diameter. They are forming the Zodiacal Cloud, a system in constant replenishment because mm-sized meteoroids tend to fall into the Sun in timescales of tens of millions of years (Ma) due to the loss of kinetic energy by irradiative effects. Most meteoroids coming from asteroids were released by impacts, while outgassing is the force driving cometary meteoroids to heliocentric orbits. Comets are significant contributors because they are fragile objects composed by a mixture of ices, organic materials and mineral grains as Stardust (NASA) and Rosetta (ESA) space missions have demonstrated. These objects suffer significant ice sublimation when approaching to the Sun. Then, volatile-rich regions produce jets of gas that drive out tons of meteoroids with diameters from dm- to tens of microns. These meteoroids are forming meteoroid streams that can be stable in their orbits for thousands of years. Despite of their quantity and significance, these particles are not surviving to atmospheric entry and we need indirect systems to understand their origin and composition. 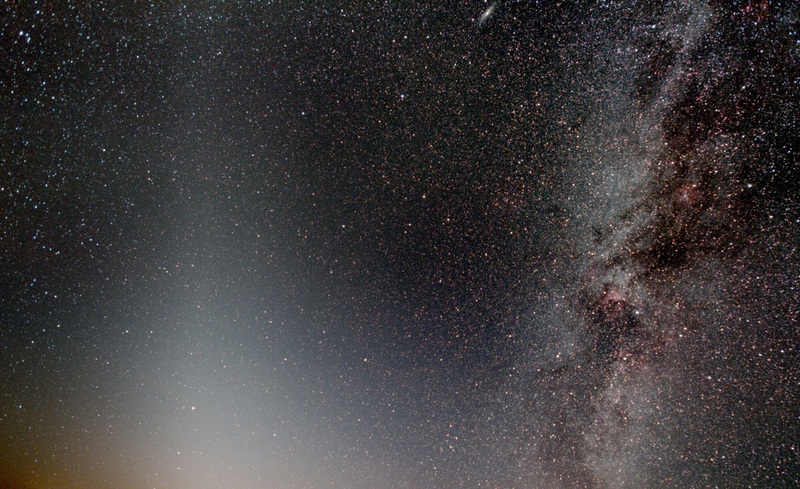 The Zodiacal cloud is produced by the light reflected in dust particles surrounding the Sun. Credit: Iko Margalef/Cel de Vinaros. Meteoroids are moving around the Sun at tens of km/s. Consequently, when encountering the Earth they reach the top of the atmosphere with usual velocities far higher than 50.000 km/hour. Then, they are abruptly decelerated due to the atmosphere shield, and produce a luminous phenomenon called a meteor. A meteor brighter than Venus is called a fireball. When penetrating into the atmosphere the meteoroids suffer collisions with atmospheric components (atoms or molecules) and their surfaces are heated. Then, a physical process called ablation produces the vaporization, fragmentation and sputtering of meteoroid components. From the ground, at typical distances of hundreds of kilometers, the light is emitted producing a column of ionized gas or meteor that consists of three differentiated parts. The head or region around the meteoroid in which the interaction takes place, the wake left just behind and the train or meteor column. The meteor head is the part that mostly contributes to produce the light as in the particle’s front suffers the more energetic collisions with air components. Then, it is the main source of emission lines. The meteoroid-forming minerals are progressively vaporized and the chemical elements are released suffering ionization and producing a cloud of ions, and free electrons forming a significant part of the ablated material. The electrons are transmitting energy, and the ions emit light through well-defined emission lines, while that surviving dust contributes to heat the medium. A Perseid fireball recorded during the 1993 outburst on a circumpolar stellar exposure. Credit: J.M.Trigo-Rodríguez/CSIC-IEEC. Meteor spectroscopy is a way to deep into the processes taking place during ablation, but it is also a pathway to better understand the delivery processes of exogenous materials to Earth. From the very beginning of this field early in the 20th century, emission spectra allowed the identification of emission lines from rock-forming components. Emission spectroscopy can provide also direct evidence on the rock-forming elements participating in the continuous delivery of primitive materials from undifferentiated bodies. In fact, these fragile meteoroids are severely fragmented in the atmosphere and unable to survive atmospheric interaction. We know now that this is direct consequence of the fragile nature of these bodies that are weakly-bonded aggregates formed by fine micron-sized dust, organics and volatiles. The difficulty of studying meteor and fireball spectra is multiple. To get chemical information, the light emitted during the unpredictable entry of a meteoroid must be decomposed by a prism or diffraction grating set up in front of imaging systems. The system records the light emitted by the meteor as separated emission lines. Meteor spectra are nowadays recorded in CCD or digital video cameras, but in the past the pioneers did so using photographic plates (Ceplecha, 1961; Halliday, 1961). Nowadays a significant progress has been made: from the relative intensity of the lines the meteor spectrum can be fitted to a physical model that allows computing the temperature, and elemental abundances of their rock-forming can be computed having into account the intensity of lines (Borovička, 1993). The model assumes thermal equilibrium in the meteor head, and considered the radiating volume as a prism where the physical parameters and the chemical abundances can be determined. The chemical abundances of incoming meteoroids are inferred from the sequential spectroscopy of the luminous trajectories of photographic fireballs during their entry into the terrestrial atmosphere. In that work, the averaged chemical abundances for the main rock-forming elements of meteoroids were obtained, and later were discussed in Trigo-Rodríguez et al. (2003). 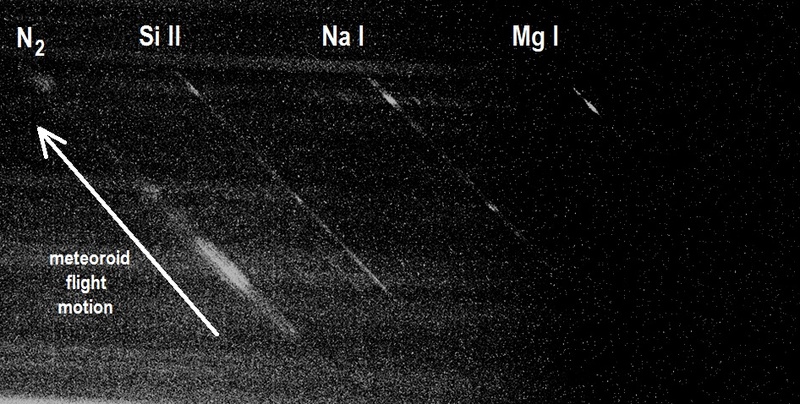 By using this indirect technique we discovered the overabundance of sodium in cometary materials (Trigo-Rodríguez & Llorca, 2007) that has been recently confirmed from Rosetta studies of comet 67P/Churyumov-Gerasimenko (Schulz et al., 2015). Consequently, light provides direct information about the composition of the incoming meteoroid, even it will not survive. Its chemical signature will remain in the record for further study. In this way, and particularly recording the same meteor from different recording stations, it is possible to infer the meteoroid orbit, establish the mechanisms of transport to Earth and the nature of the forming materials. In conclusion, most meteors emit light during its abrupt deceleration in the upper atmosphere of the Earth. The spectroscopy of meteors and fireballs decompose and record such light with modern detectors allowing us to gain insight into the bulk elemental chemistry of meteoroids, their ablation temperatures, and column meteor density of ionized species. Then, there is no doubt that meteor spectroscopy is an added-value technique that exemplifies the power of studying light to better understand hidden natural processes. 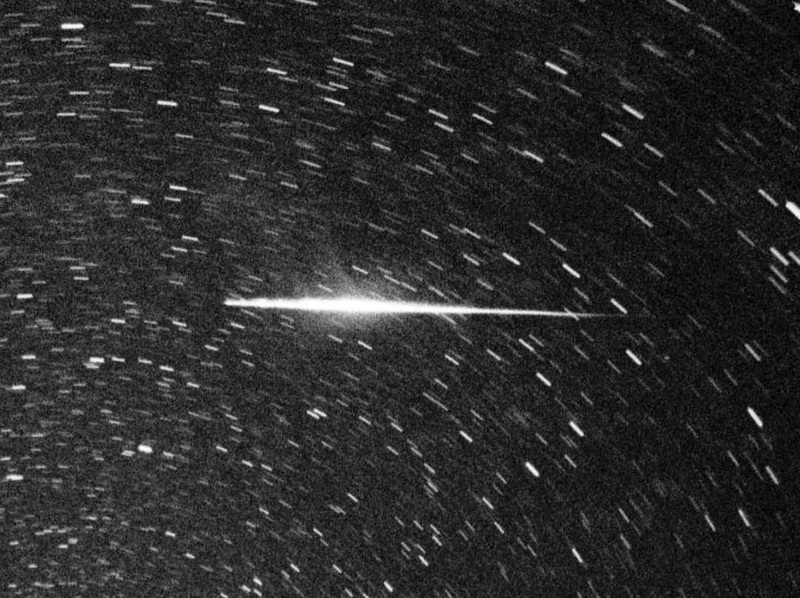 A Perseid fireball spectrum recorded from El Arenosillo station (Huelva, Spain) on a CCD camera on Aug. 12th, 2004. The elements producing the emission lines are indicated. Credit: Trigo-Rodríguez et al., 2005. To the memory of pioneer Prof. Znedek Ceplecha. Borovicka J. (1993) “A fireball spectrum analysis”, Astronomy & Astrophysics 279, 627-645. Halliday I. (1961) “A study of spectral line identifications in Perseid meteor spectra”, Publ. Dominion Observatory Otawa 25, 3-16. Schulz R. et al. (2015) Comet 67P/Churyumov-Gerasimenko sheds dust coat accumulated over the past four years. Nature 518, 216-218. Trigo-Rodríguez J.M. and J. Llorca (2007) On the sodium overabundance in cometary meteoroids. Advances in Space Research 39, 517-525. Trigo-Rodríguez J.M., J. Llorca, J. Borovička and J. Fabregat (2003) Chemical abundances determined from meteor spectra: I. Ratios of the main chemical elements, Meteoritics & Planetary Science 38, n. 8, 1283-1294. Trigo-Rodríguez J.M., J. Llorca and J. Fabregat (2004) Chemical abundances determined from meteor spectra: II. Evidence for enlarged sodium abundances in meteoroids, Monthly Notices of the Royal Astronomical Society 348, 802-810. Trigo-Rodríguez J.M., A.J. Castro-Tirado and J. Llorca (2005) Evidence for hydrated 109P/Swift-Tuttle meteoroids from meteor spectroscopy. 36th Lunar & Planetary Sci. Conf. (2005), abstract #1485. 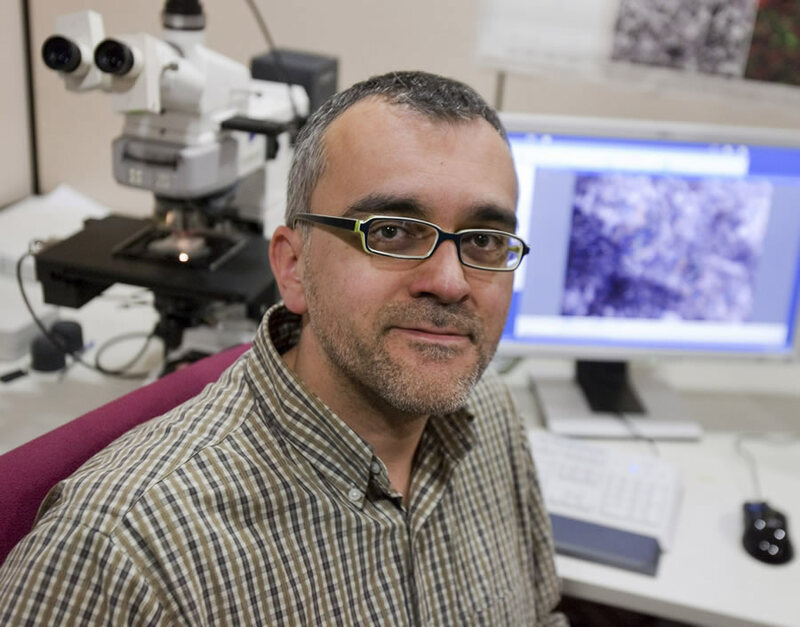 Josep M. Trigo-Rodríguez is an astrophysicist fascinated with understanding interplanetary and interstellar matter and their constant arrival to Earth. He obtained his degree in Physics for the University of Valencia in 1997, and his Ph.D. degree in Astrophysics in 2002, partly realized at Ondrejov Observatory (Czech Republic). Between 2003 and 2005 he got a postdoc position to study primitive meteorites at the University of California Los Angeles (UCLA). He leads the Meteorite, Minor Bodies and Planetary Sciences Group at the Institute of Space Sciences (CSIC-IEEC). He has published about one hundred papers in peer-review journals, thirteen books, and many articles to popularize astronomy. For more details visit his homepage.